The gold colourway is identical to Oro Rosso. The only difference is in the shapes that were produced for the two ranges during 2011-2012. Trials for the silver colourway, tentatively called Argento Rosso, were produced in 2012. During 2010-2012 there are two pieces in this collection: a perfume bottle, 7 cm diameter, and an open bowl, 11 cm in diameter. Each piece had an edition size of 250 and were made and signed by Timothy Harris. 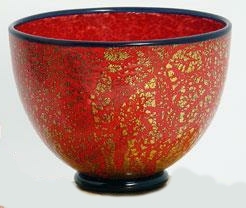 This footed bowl is signed by Timothy Harris, dated 2010, and numbered 12. 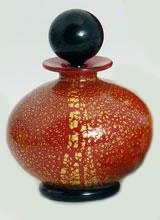 This footed perfume bottle is signed by Timothy Harris, dated 2010, and numbered 14.